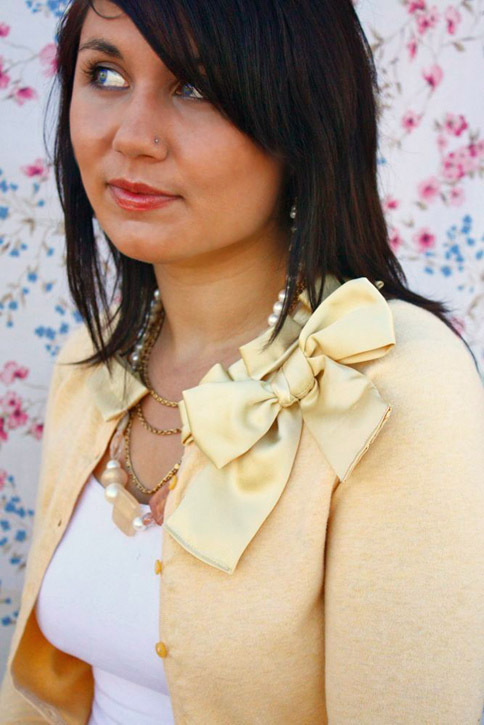 Today, Disney from Ruffles and Stuff is sharing a super cute thrift refashion with us. I’ve been following her blog for a few years and she is so genuine and sweet spirited–AND, she is crazy talented! Disney, thanks for sharing! It’s so nice to be here today, I just love Kendra’s blog and her projects. And may I just say: she has the coolest job ever!! Getting paid to shop at a thrift store?? Yes, please! That’s the life. I’m a huge thrift shop fan myself and as a crafter on a budget, most of my supplies come from Goodwill or some other local thrift store. I love the thrill of the hunt! Isn’t that pretty? No one would ever guess I made it from two old thrifted tops! To add a ladylike twist to your own cardigan, you’ll need some extra material in a matching or coordination fabric. My “fabric” was this satin tank I picked up at a thrift store for $.50. 2. Cut two strips, 3.5″by your length measurement, fold right-sides together, and sew down one side. 3. Turn the strips right-side out, and press with iron, seam in the center. 4. Turn both ends under and stitch closed. 5. Pin each end to to opposite ends of your cardigan, being sure that your seam faces down. 6. 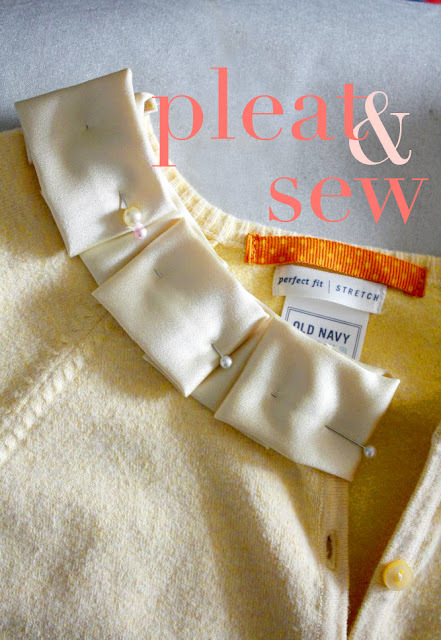 Fold into pleats, pin, and sew down the middle with a straight stitch. You may have to mess around for a while to make sure your pleats are even, so just take your time. You want to make sure they match up well before you sew! 7. Using one 27″x5″ strip, repeat steps 2-4, and tie into a bow. Then you can stitch it to your sweater, or attach a safety pin for more versatility! For $.50, I turned a rather boring cardigan, into a “favorite-sweater-ever” cardigan. Hot dog! Do pay attention to the washing instructions for the material you are using for the pleats and bow. It may turn a “tumble dry low” sweater into a “lay flat to dry” sweater. If you can’t find extra material in a matching color, try a cute coordinating one! Or even a fun print. I hope you enjoy the tutorial! Thanks so much for having me, Kendra! Love this! Too bad my sewing skills are basically non-existent. She has some sewing 101 tutorials on her blog! This post was done by Disney from Ruffles and Stuff. She’s amazing! That is absolutely adorable! My teen daughter would probably love it too! I’ve always desired to know how to sew-guess I better get to it, if I’m ever going to! Then I can make one of a kind goodies like this!